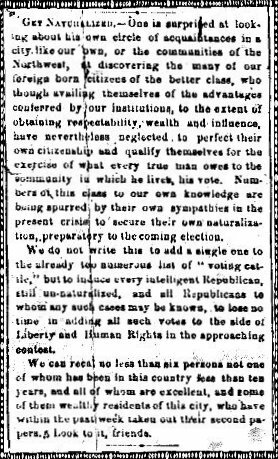 A call for immigrants to file their papers appeared on the front page of the Chicago Daily Press and Tribune Saturday October 30, 1858. The reward for citizenship would be the right to vote in the upcoming election for the Illinois senate. For weeks prior to this notice being published, Abraham Lincoln and Stephen Douglas had been in the throes of The Great Debates of 1858. You may have noticed the call was not directed toward the immigrant masses yearning to be free. It was pointedly asking those who had made their fortunes in the United States to become her citizens. My ancestor John can actually applied twice to be naturalized in the state of Ohio. That was handy as there was different information on the applications. In the end, he moved to Iowa and never completed the process. How lucky for you! Those paper trails make the search so much fun, don’t they?